Pakistan today formally presented President Pervez Musharraf’s “out-of-the-box” proposal on demilitarisation of Kashmir which India disposed, saying that New Delhi wanted to be “more ambitious” than demilitarising just three cities of Kashmir and counter-proposed to make the Line of Control as a Line of Friendship. Two Pakistani militants, belonging to the banned Lashkar-e-Toiba (LeT) outfit, were today sentenced to 10 years’ rigorous imprisonment by a city court along with their three Indian accomplices for masterminding the 1997 serial blasts in Punjab, Delhi, Haryana and UP, resulting in the death of 17 persons. Should lawyers go on a strike? Uttar Pradesh Chief Minister and Samajwadi Party chief Mulayam Singh Yadav, whose relations with the UPA government are under strain over the phone-tapping issue. 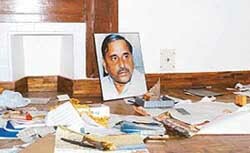 Household articles and a framed photograph lie on the floor during the evacuation of the government accommodation by Uttar Pradesh Chief Minister in New Delhi following a court order on Wednesday. Refuting the Opposition charge, Prime Minister Manmohan Singh today asserted that there was no political interference in the defreezing of London bank accounts of Italian businessman Ottavio Quattrocchi, prime accused in the Bofors pay-offs case. Playing the role of an errant son, H. D. Kumaraswamy today cast off the secular cloak of his father and former Prime Minister H.D. Dewe Gowda to shake hands with the Bharatiya Janata Party and stake his claim to form a government in Karnataka. I often hear that the CBI takes too long a time to complete its investigations. How far is this true, I cannot say. However, you need to seriously ponder over this issue and take remedial measures. From laying down their own life to giving the gift of life to another, to braving gun-wielding militants, from rescuing a girl from a tiger’s jaws to rescuing an infant from a burning house. The government wants the Indian Institute of Management (IIM) to first review their Memorandum of Association and then think of opening branches offshore. The intense cold wave conditions sweeping Himachal Pradesh claimed four lives in the past 24 hours even as life remained paralysed in many districts. Two persons died in each district of Kulu and Kinnaur. Investments in Punjab by Non-Resident Indians hailing from the state are projected to touch Rs 5,000 crore by the end of this year, with a new theme “Think India – Think Punjab” being worked upon to attract potential investors looking towards India.